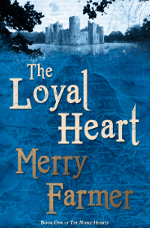 For this week’s Medieval Romance Monday, we are featuring The Loyal Heart by Merry Farmer. “I began writing The Loyal Heart at one of my lowest points in recent years. I had just been through a bad break-up and was feeling sad, alone, and betrayed. Writing has always been a solace for me, but at that point it was the furthest thing from my mind. I also got into a debate about the Robin Hood legend with a friend at about that same time. As someone who majored in History, the story of Robin Hood has always irritated me because it presents King Richard, Prince John, and the situation in England during the Crusades in such a false light. That’s not the way it actually happened. I was trying to tell this to my friend and wasn’t sure if I was getting anywhere. The Loyal Heart is Book One in The Noble Hearts series. We will be featuring the second book in this exciting medieval romance series, The Faithful Heart, in our next Medieval Romance Monday feature, so please come back to read more about it. If you just can’t wait that long, you can head right here: The Faithful Heart by Merry Farmer.